Flags that predate the Civil War are very rare. Of those few that have survived, many are very large flags intended for use on ships. Very small flag that predate the Civil War are extremely scarce, and seldom ever encountered. This particular flag, at just 5-1/2 inches x 8-1/2 inches, is the smallest hand sewn flag I'm aware of from the first half of the 19th century. Made of hand sewn silk, the flag has 26 delicately painted white stars. A note on the scrapbook page where the flag was preserved reads "Made by Mary R. Blair, A.D. 1836". 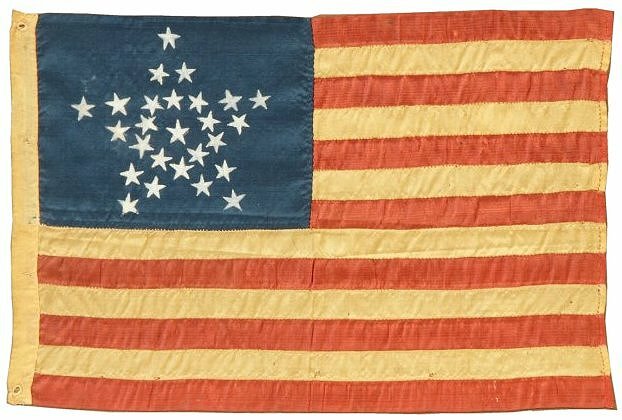 The period of 26 stars, from January 26, 1837 to March 3, 1845, saw a popular surge of flags made in the Great Star pattern, also known as the Grand Luminary pattern. The small, delicate hoist and whip-stitched grommets, charming proportions, rich coloration, and folky painted Great Star combine to form a beautiful and rare early American flag.